The system TCC 8303.I marks the running surface which is output after the extruder, inspects the colour lines for their completeness and measures the width of the running strip. The integrated system TCC 8303.I has been developed for the inspection of colour codes on running surfaces of tyres. The cartridges for the marking are inserted in a holder. 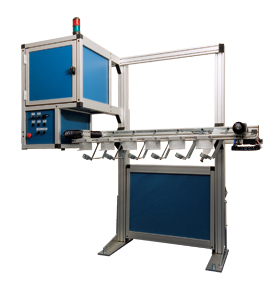 A pneumatic height adjustment and a servo controlled horizontal positioning ensure a straight line and optimal position of the code lines. The colour code is immediately inspected by an image processing system.